With the 24/7 job of caring for an infant, new mothers hardly have time to shower or sleep, not to mention worry about how they will go about losing their “baby weight.” Reaching an ideal body weight is (and should be) desired by many women, though prioritizing a healthy diet and exercise is no easy task with a new baby in the picture. That's why most new moms may be intrigued by a recent study suggesting that canola oil can reduce belly fat. Participants who consumed monounsaturated fats in the form of canola or high-oleic canola oils daily for four weeks reduced their belly fat more than those who consumed a flax/safflower oil blend. Researchers think that the higher amount of monounsaturated fatty acids found in canola oil caused the reductions in belly fat. Though one study is not enough to confirm these results, it can provide another reason for people to replace saturated and trans fats with heart-healthy unsaturated ones, which may hold the possibility of weight loss as an added benefit. All of the oils used in the study were unsaturated fats, which are heart healthy when used in place of saturated fat – the type of fat found mostly in meat and dairy products. Unsaturated fats can be either monounsaturated or polyunsaturated. The monounsaturated variety contains one double bond in the chain of carbons that makes up the fat molecule, while polyunsaturated fat contains more double bonds in its structure, making it even more flexible; this is why polyunsaturated fats remain liquid when refrigerated or frozen. Whereas polyunsaturated fats can reduce cholesterol, monounsaturated fats have the benefit of being able to not only reduce LDL cholesterol (the “bad” cholesterol), but also to raise HDL cholesterol (the “good” cholesterol). However, despite this new study, there is still insufficient evidence to prove that monounsaturated fats are healthier or should be consumed more often than polyunsaturated fats. Foods that contain unsaturated fats usually contain a combination of both mono and polyunsaturated fats, though some have a significantly higher proportion of one over the other. Examples of foods high in monounsaturated fats include olive oil, canola oil, peanut oil and avocado. Examples of foods high in polyunsaturated fats include soybean oil, safflower oil, corn oil and oily fish. Nuts and seeds contain both mono and polyunsaturated fats- walnuts tend to be higher in polyunsaturated fats and almonds higher in monounsaturated fats. Instead of using butter on bread, try a plant-based buttery spread that contains mostly unsaturated fats (like Smart Balance), or dip bread in olive oil instead of using butter; just be sure to keep it to a tablespoon in order to control calories. Instead of spreading butter or cream cheese on your bagel, try natural nut butter such as almond, cashew or peanut butter. Replace half of the granola added to yogurt with whole nuts such as almonds or walnuts. Try to consume low mercury fish at least two to three times a week and use canola oil when sautéing foods and in place of butter when baking. 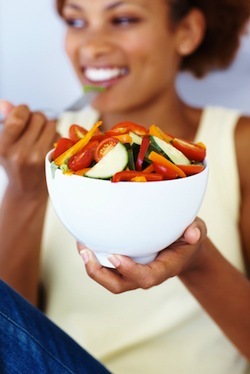 The best and most evidenced-based ways to lose post-pregnancy pounds are to fill half of your plate with fruits and vegetables, consume fat in moderation (20 to 35 percent of calories); when you do, make sure most of it is unsaturated and aim for at least 30 minutes of aerobic exercise such as brisk walking (or chasing after a wild toddler!) every day.